A yoga instructor manages to balance her pregnancy with an upside-down career. Everyone handles pregnancy differently. Lizzy Tomber preferred to spend hers upside down, suspended in mid-air, and balancing on her husband’s feet. Lizzy is a traveling yoga instructor. She specializes in acroyoga, an intensive form of yoga that combines traditional poses with acrobatic moves performed with a partner. Along with her husband Josh Young, Lizzy runs Acropedia, an online community of acrobats and yogis. Together, they travel around the country, leading acroyoga workshops and training sessions. Acroyoga, which got its start in California about a decade ago, makes use of familiar yoga poses, like planks or back bends, but the exercises often take place while balancing on a partner’s feet or hands. The idea is to use gravity to promote strengthening and stretching. Lizzy compares some types of acroyoga to Thai massage, where a partner’s manipulation of your muscles creates deep relaxation. However, Lizzy and Josh prefer a more dynamic form of practice, one that emphasizes a more acrobatic type of performance. Letting your partner toss you into the air and catch you with his feet isn’t exactly the sort of thing endorsed by Dr. Spock, but it made perfect sense to Lizzy, who has been doing acrobatics since she was a child. As a young girl, she is now 33, Lizzy would force her siblings lay on the ground while she did diving rolls and backbends over their rigid bodies. “I would be climbing up door frames and instead of telling me to stop, my mom would tell me to climb higher,” she says. Lizzy even has pictures of herself doing acroyoga on her wedding day. When Lizzy became pregnant, she thought that the aerial somersaults would have to stop. “We used to do a lot of moves where my husband would throw me and catch me on my belly with his feet,“ she laughs. ”Obviously that couldn’t happen anymore.” But what could she do? Lizzy attributes her acroyoga practice to her to keeping her healthy and happy during her pregnancy. Instead of feeling like a disability, her pregnancy felt empowering. “I didn’t get sick, I was happy, I was active. 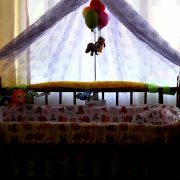 I really felt great the whole time,” she says. 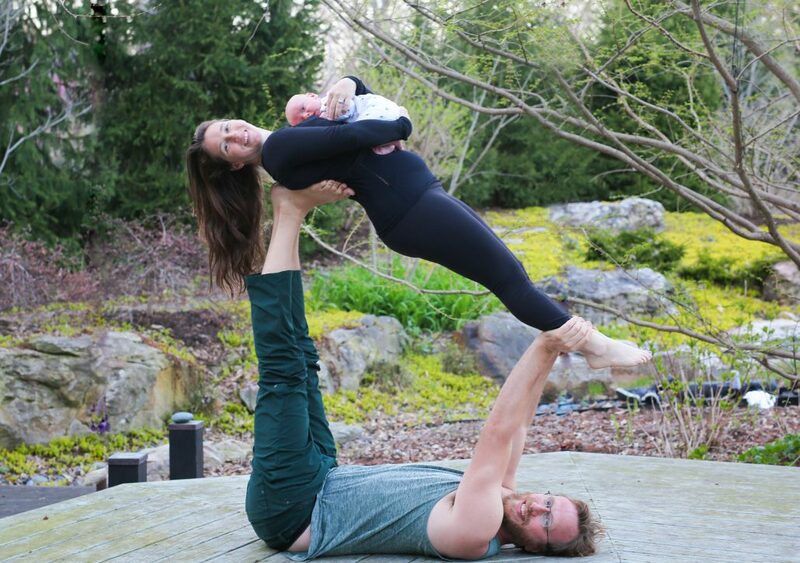 Since giving birth to her son David in February, Lizzy has taught other pregnant women in her workshops and continues to perform acroyoga, often with her baby in a sling on her chest. 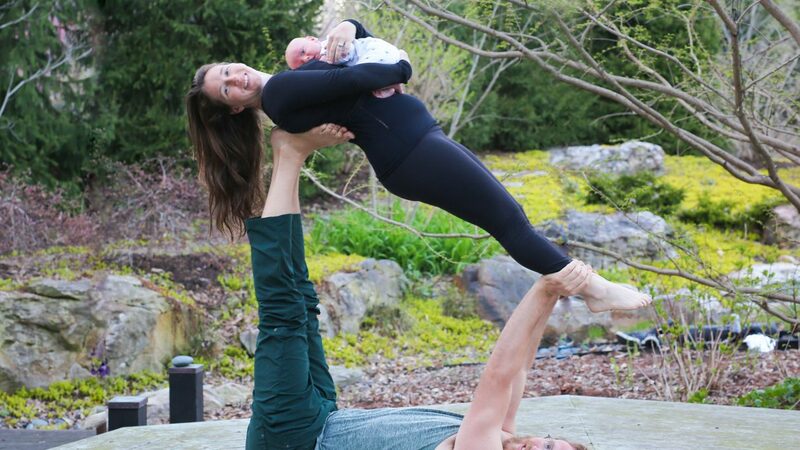 When he’s older, Lizzy and Josh hope that acroyoga will be a natural part of David’s life, but until then, they are trying to teach an entirely different generation of Tomber the benefits of acroyoga. For her 100th birthday, Josh balanced Lizzy’s grandmother on his feet, proving that you’re never too old, too young, or too pregnant to stay fit in whatever way feels most natural. Even if that’s somersaulting through the air.